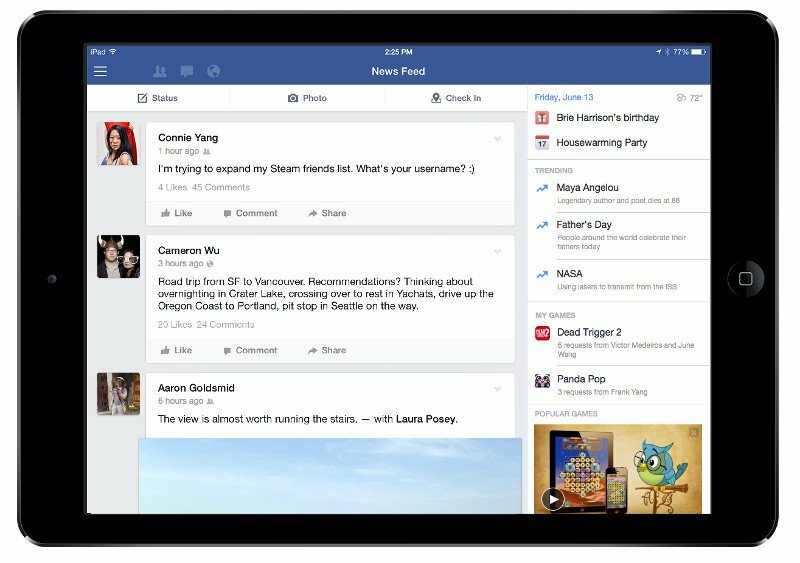 Facebook has just brought about a major update to its iPad app. The new Facebook for iPad update brings a lot of new features including a games sidebar. The new update revamps the app and puts the focus on games. To find the new sidebar, you will need to turn your iPad into landscape mode and the new sidebar will become available. The sidebar will feature tabs for “My Game” and “Popular Games”. Facebook will also suggest you games based on your gaming history and games your friends play. Facebook also plans to eventually introduce ads in the sidebar, so that game developers can lure gamers. That’s not all with the update, Facebook has also introduced trending topics and videos in the app. As you might have already guessed, they do what the web version does. Trending topics shows you the most discussed topics on Facebook while Trending video shows you the most shared videos. The update is available to some users in the US and Facebook plans to bring these features to everyone soon.